Hello everybody. A few weeks ago, WotC posted the updated Banned & Restricted (B&R) list for Standard and Modern and the key bans in those formats really shook up the meta game. 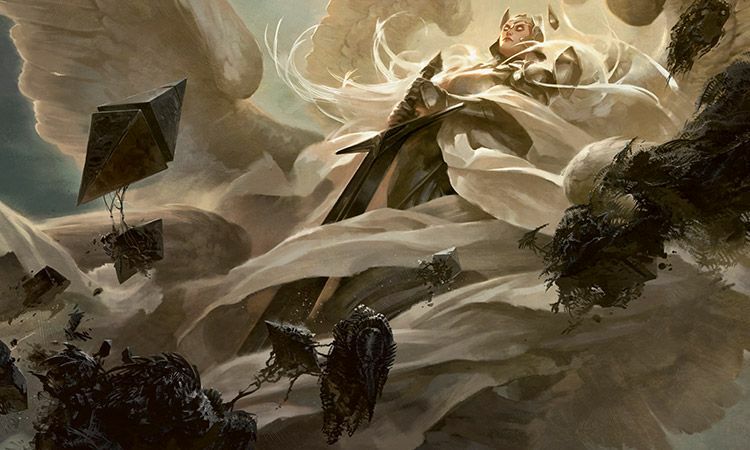 In a short couple of weeks from now the banlist shall be updated again, and although many debate whether there will be continuing bans, the conversation around banlists is an interesting one. Today I thought I’d bring that topic to Elder Dragon Recycling and discuss the intent of bans, their effectiveness and what the current banlist is and how it could be changed. This will be an introductory session to players newer to the format or those who simply want a reminder on the topic of banlists at hand, so if you don’t want to hear some rehashing feel free to drop to the next paragraph. Banned cards are cards that are not legal to play in your deck, whether mainboard or sideboard. Normally this is enforceable at tournament levels and in formats played there, but Commander is almost exclusively a social and more casual game. Why have a banlist at all? The Rules Committee (RC) has criteria, which I will lay out later, for what gets banned but the general rule is to promote the social and casual aspects of the format. To this end, the RC banlist is not the be-all-end-all like it would be for Standard or Modern. Instead, this is the suggested banlist to start off with and the RC encourages players to make their own changes and play with rules and cards their playgroups are comfortable with. But in the end this banlist is adhered to by many people, if only for its simplicity and the fact that it makes it easier to play with new people and not have conflicting decklists. The RC has laid out some basic criteria for when they consider banning cards. The following link leads to a list of those criteria but I will also be going over them in short here: http://forum.mtgcommander.net/EDH_Forum/viewtopic.php?f=1&t=12254. Interacts Poorly With the Structure of Commander. Produces Too Much Mana Too Quickly. Creates a Perceived High Barrier to Entry. Let’s discuss them quickly. Rule 1 largely refers to cards that go TOO big or don’t operate within the “spirit of the format.” A perfect example is the card Worldfire which is basically antithetical to the structure of Commander. Rule 2 is simply that generally equal decks can become massively imbalanced in one direction by the use of specific cards. Trade Secrets is a tool that might let an otherwise average deck draw massive quantities of cards out of nowhere and bury their opponents in card advantage. Rule 3 is a fancy way of stating the card sees too much play. Prophet of Kruphix was, for its’ time, the most played creature in UGX decks, regardless of strategy, power level or budget and was simply everywhere in the format. Rule 4 is referring cards like Channel or Fastbond that can accelerate players ahead very rapidly, dropping creatures like Emrakul, the Aeons Torn far sooner than most might consider fair. Rule 5 is mostly for the Power 9 (the Power 9 are the 5 Moxen, Time Walk, Timetwister, Black Lotus and Ancestral Recall, all of which are banned with the exception of Timetwister) and cards like Library of Alexandria that are considered simply too expensive for the vast majority of players and so they are banned in the hopes of keeping the desire for the cards out of the format in the first place. This is not to say that I or many players agree with their reasoning or the mentioned cards, but there is a clear method to their decisions. The one rule I take umbrage with though is Rule 4. I can understand wanting to keep acceleration from getting out of hand but stating that making too much mana too quickly is a problem in a format that allows Sol Ring, Mana Crypt and Mana Vault seems a bit contradictory. I’m not arguing to ban these cards but if you’re going to ban cards that make too much mana too early then these are also prime contenders for that reason alone. One of the main reasons these cards don’t get banned however is likely the inertia behind them. These are cards that see play almost exclusively in Commander (and obviously Vintage) because they don’t belong anywhere else. It also doesn’t help that Sol Ring itself has been printed in every Commander precon deck released by WotC to date, and suddenly having banned cards in most of your precon products seems like a bad idea. The RC is independent of Wizards but WotC does maintain some presence on the committee and there is a lot of communication between the two bodies. This is a lot harder to quantify when the goal of a ban isn’t to improve competitive play and measure deckspread with data to back up conclusions. But Commander is particularly healthy at the moment and, unlike some other formats, usually us quite healthy. When EDH becomes problematic, it usually readjusts post-ban and stays that way until new cards come out. I argue that banlists for EDH do their job properly when curated properly and that they serve the format as a whole rather decently. Now I want to go through the current banlist and discuss the reasons behind them and whether or not they could be taken off of the list. Afterwards I’m going to discuss some cards that the community has constantly debated adding to the banlist, regardless of the fruition of these ideals. There are also a few cards that are constantly in the discussion for banning. Consecrated Sphinx, Iona, Shield of Emeria and Sol Ring/Mana Crypt are on message boards and in minds whenever a banlist discussion comes up. Sphinx draws an absurd number of cards from one go around of the table and only grows exponentially as the game draws on. An early Iona utterly blocks at least one opponent from playing the game properly and probably slows down most of your opponents in general. Lastly, there are many who argue that Sol Ring/Mana Crypt are too close to the bill of Channel and Fastbond and give too much mana too quickly. It is unsurprising – when was the last time someone played Ring or Crypt against you on turn one and you felt unconcerned? Of these, I think Iona has the most merit to getting banned. The defense against her, that she is costly and only hoses one colour, is not very strong. Most of the time she’s being cheated out. Whether it’s reanimation in Karador or coming in hot off of a Kaalia, Iona rarely costs 9 mana. And even when she does, she’s far more oppressive than most stax effects, keeping people off of entire colours, and monocoloured decks from playing any cards entirely. If any new cards were to be added to the banned list, Iona is the first in line. Since I haven’t issued much beyond direct discussions, I want to get to the real purpose of today’s article. Bring back the “Banned as Commander” list. The RC did away with the list several years ago over concerns that it was too much information for newer players to keep track of and could send mixed signals. I counter that it was a healthy way to allow legendary creatures into the format that might be too toxic or overpowered as commanders. As mentioned before, Braids, Cabal Minion is a perfectly fair card that is only broken when she’s your commander and you can accelerate into her on turn 2 or 3 where you use her to keep your opponents from every getting out of the early stages of the game. But bring back the Banned as Commander list and you keep these problems from occurring without removing otherwise fair cards from the format completely. Kokusho, the Evening Star was removed from that list and later the banlist as a whole after the RC discovered it wasn’t actually as oppressive as they thought it was. This sort of thinking could help liven up the format without the dangerous shakeups that plague more competitive formats. I think we should discuss this idea more in our community and pressure the RC to bring the list back, especially since it might help end the griping against the more competitive commanders out there. I’ll see you next time for a study in morphology. Ban Hammer, Commander, EDH, magic, MTG, MTGDecktechs. Bookmark.